I had my dream wedding! 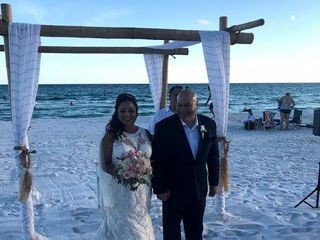 I just got married in Destin Florida with Royal beach weddings and I live in Texas. I was very nervous to start, but all of that disappeared. Justy, Julia and Diana are phenomenal! The communication was completely open and flexible. They were so friendly, accommodating, understanding and caring. My wedding was as smooth as a wedding could possibly be. It flowed beautifully and efficiently. 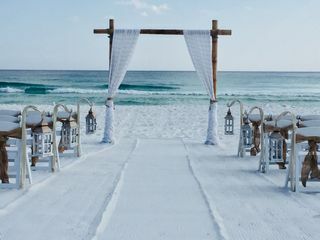 Destin is such a beautiful destination and the royal beach weddings company is unbelievably amazing. My wedding was everything I have dreamed from the pre-wedding all the way through to the reception; I could not have asked for a more perfect day! My pictures were breath-taking and way beyond what I was expecting!!! This is a day I will forever remember every detail and all thanks to The Royal Beach Weddings. Thank you Justy, Julia and Diana! Thank you so much for those very kind words! It's a blessing for us serve! Please come back and see us. Justy and his crew were absolutely amazing in every way. I, the bride, of course was running late and they completely understood. With a very blended family, there’s was a lot of people to deal with. Justy walked through the directions very detailed but yet still simple. Very easy going and stress free. Absolutely recommend to anyone wanting a smaller sized wedding, or large. Very budget friendly! I was so amazed on how everything went so smoothly! If we had a question or needed to make changes, Justy and Diana were always there to assist us. Our Minister Lee that performed the ceremony was just as great! He called me the morning of just to go over everything with me one last time which really put me at ease. I could not have been more calm and relaxed for the simple reason I really felt we were in great hands. Also, one of the things that we decided to add on through the planning was the Photography package. I am SO glad we did! All the shots our Photographer Julie was taking looked so beautiful! Julie was so great to work with as she made sure to get the perfect shot every time! Mark officiated our wedding and he was incredible! On time and reliable. I got so many compliments on Mark as he performed the most beautiful ceremony. 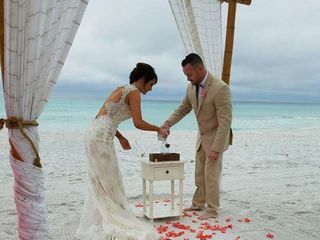 Royal Beach Weddings provided us with the most perfect wedding. Our day was everything we dreamed of and more. Hiring Dianne and Mark to perform our wedding was one of the best decisions we made when planning our wedding. From beginning to end, they took meticulous care of each and every detail. It was a special blessing to spend time with our families before the ceremony and know that Dianne and her wonderful husband Mark were making sure every detail was in place. She helped me with last minute fixes for my flowers and she even added thoughtful extra touches that ensured the integrity of each petal. We are so glad to have had them there to guide us through our one of the most memorable moments of our lives. Mark performed our ceremony and our hearts were so touched by his kind and loving ceremony. The beach was such a beautiful location and our guests were so impressed and fell in love with the charming presentation. 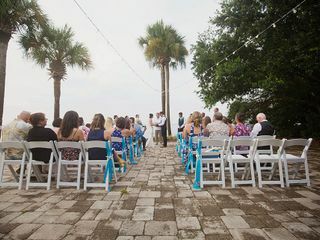 I have to share when I began to walk down the aisle, I was in awe of the romantic and picturesque setting before me. We received an abundance of compliments from our guests on the how gorgeous the wedding was! Thank you again for everything you did to provide a beautiful wedding, it will live in our memories forever! Beautiful ceremony, so happy with everything. Wonderful communication all throughout the planning process and leading up to our wedding day. I added the photography package and our photographer was WONDERFUL!! Only downside is I have to wait 8 long weeks to get the pics.....which is understandable in peak season, I’m just so excited to get them. So very grateful to Justy and everyone at Royal Beach Weddings! I could not have asked for a more perfect wedding! Everything was stress free and ended up being beautiful! The photography was amazing. This company was just so wonderful! They picked up our ceremony last minute and managed to get all of the details that we wanted. Justy gave a wonderful ceremony with such kind words. Thank you royal beach weddings! Would 100% recommend Justy and his team to anyone planning a beach wedding! Exceeded every expectation I had and my only wish is that I could relive the day over and over again! Our wedding ceremony was perfect! Highly Highly recommend!! Just had our wedding done with RBW and it was PERFECT! It was simple, on the beach and exactly what we wanted. Being from out of state makes you wonder about how so many things are going to turn out, but anytime I called, Justy was attentive and answered all the questions I had. The prices were reasonable and they even allowed me to make a last minute (like 2 hours before our start time) ceremony music change. Also our officiant was really nice and I liked what he said during the ceremony. Everyone thought the ceremony was perfect! I highly recommend this company! Royal Beach weddings was awesome!!! They were so helpful when picking out our beach ceremony location and quick to respond to all my questions! We had a beautiful spot on Henderson beach and our pictures turned out beautiful! The decor they used was absolutely beautiful!! Lee the officiant was so great to work with as well! We had so many compliments on how much he personalized the wedding and how nice it was! The photographer was awesome! She was so fun to work with and so sweet!! We got all our pictures back in less than a month! Justy was so knowledgeable and such a big help through everything! Our wedding was everything we hoped for! Couldn’t have been happier!!! great and professional service . we will NEVE FOGET our dream day. will will be back to re new our vows..
loved them and their staff, met all our needs thank you ALL!!!! I had an amazing wedding using royal weddings! From beginning to end every question I had was answered, every recommendation was spot on. I wouldn’t change a thing they come highly recommended. My wedding turned out perfect! I want to think Royal Beach Wedding for being on top of their game! Being an out of town bride I was nervous how it would all come together, but Justy and his team was awesome!!!!!! I highly recommend using them! Royal beach weddings was wonderful for my last minute March wedding! They made it so simple and stress free. First an foremost I would like to thank Julie, Justy, and their staff for an amazing wedding day! We could not have asked for a more perfect day. Our first reaction was WOW, lets get married again! This reaction would not have been possible, if it wasn't for the teamwork displayed by Justy and his staff. Even with the adverse weather we were experiencing, Justy made us feel at ease, filling us in every step of the way. He was very fluent as an officiant and recited the vows by memory. His demeanor was beyond professional. He was very articulate in way he flowed through the wedding process from start to finish. Julie has a bubbly, fun, and energetic personality. Her photography experience was definitely highlighted during our day. She has a process that makes picture taking fun and enjoyable. She transitions from pose to pose without wasting time, which is valuable when taking sunset pictures on the beach. In conclusion we highly recommend Royal Beach Weddings to make your day extra special and worry free! Professionalism, friendliness, and quality of service are their strengths. From the Adams family, we thank you from the bottom of hearts!! 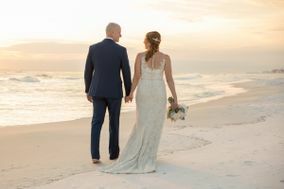 I highly recommend Royal Beach Weddings to anyone planning a wedding near Destin/Miramar Beach. We can't thank Justy, Julie, and Dianna enough for making our wedding day the most special and well organized event we could have ever dreamed of! The initial thought of just showing up from out of state and trusting others to have pulled together all the details for your BIG day was a bit nerve-racking, but I can say there was never a doubt in my mind that the details would be fulfilled to our wishes. They truly run this business as if they are there to serve their customers and ensure their happiness and we are so grateful for the care and level of detail they put into our wedding and reception! From my first conversation with Justy, I could tell he was very knowledgeable of the entire event process and extremely helpful. He even walked me through how to go about getting our proper beach permit for the ceremony and met with us a couple days before the wedding so we knew precisely how the day would flow. Dianna was most helpful getting all of the fine details planned and I can't rave enough about how incredibly flexible she was when I had a new idea or wanted to try something different than what we had talked about earlier. Her exquisite ability to decorate for our reception had our guests (and us) so pleased and wow'd by the beauty she created for us. Having Julie as our photographer was icing on the cake. She was so laid back and fun, but extremely professional and knew exactly the images and poses that would make our photos perfect for us. She worked our photo ideas into the sequence and was one of the most fun and talented photographers I've had the pleasure of working with. Justy, Dianna, and Julie will take excellent care of you, your guests, and all of the dreams you have for your magical day! Thank you for making Geoff and I's wedding magical! Justy and his wife made our entire wedding so easy and beautiful. They were very professional and fun! I would recommend them to anyone local or planning a destination wedding as we did. Justy was amazing!!!! His work ethic and professionalism exceeded our expectations!! The wedding and reception was just lovely! The house we originally rented for the wedding burned to the ground. That’s another story...They were so great at accommodating the move to a different house at the last minute. Great folks and our pics are amazing. Thanks y’all!! Top notch would definitely recommend to anybody. Royal Beach Weddings is Amazing! They take care of you, creating the best memory of our lives! The pictures and experience were awesome! So happy!